Thujone () is a ketone and a monoterpene that occurs naturally in two diastereomeric forms: (−)-α-thujone and (+)-β-thujone. It has a menthol odor. Though it is best known as a chemical compound in the spirit absinthe, absinthe contains only small quantities of thujone, so thujone is unlikely to be responsible for absinthe's alleged psychedelic effects. Thujone acts on GABA and 5-HT3 receptors in the brain. 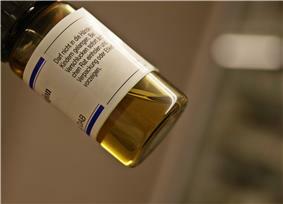 In many countries, the amount of thujone allowed in food or drink products is regulated. Thujone, as a component of several essential oils, is also used in perfumery. Thujone is found in a number of plants, such as arborvitae (genus Thuja, hence the derivation of the name), Nootka cypress, some junipers, mugwort, oregano, common sage, tansy, and wormwood, most notably grand wormwood (Artemisia absinthium), usually as a mix of isomers in a 1:2 ratio. It is also found in various species of Mentha (mint). Based on studies that looked only at molecular shape, for many years thujone was thought to act similarly to THC on the cannabinoid receptors; however, this has since been proven false. Thujone is a GABAA receptor antagonist. By inhibiting GABA receptor activation, neurons may fire more easily, which can cause muscle spasms and convulsions. Thujone is also a 5-HT3 antagonist. The median lethal dose, or LD50, of alpha-thujone, the more active of the two isomers, in mice, is around 45 mg/kg, with 0% mortality rate at 30 mg/kg and 100% at 60 mg/kg. Mice exposed to the higher dose have convulsions that lead to death within 1 minute. From 30 to 45 mg/kg, the mice experience muscle spasms in the legs, which progress to general convulsions until death or recovery. Pretreatment with diazepam, phenobarbital, or 1 g/kg of ethanol protects against a lethal dose of 100 mg/kg. These effects are in line with other GABA antagonists. Also, alpha-thujone is metabolized quickly in the liver in mice. Attention performance has been tested with low and high doses of thujone in alcohol. The high dose had a short-term negative effect on attention performance. The lower dose showed no noticeable effect. Thujone is reported to be toxic to brain, kidney, and liver cells and could cause convulsions if used in too high a dose. Other thujone-containing plants such as the tree arborvitae (Thuja occidentalis) are used in herbal medicine, mainly for their immune-system stimulating effects. Side effects from the essential oil of this plant include anxiety and sleeplessness, which confirms the central nervous system effects of thujone. Thujone is most famous for being a compound in the spirit absinthe. In the past, absinthe was thought to contain up to 260–350 mg/l thujone, but modern tests have shown this to be far too high. A 2008 study of 13 pre-ban (1895–1910) bottles using gas chromatography-mass spectrometry (GC-MS) found that the bottles had between 0.5 and 48.3 mg/l and averaged 25.4 mg/l  A 2005 study recreated three 1899 high-wormwood recipes and tested with GC-MS, and found that the highest contained 4.3 mg/l thujone. GC-MS testing is important in this capacity, because gas chromatography alone may record an inaccurately high reading of thujone as other compounds may interfere with and add to the apparent measured amount. The compound was discovered after absinthe became popular in the mid-19th century. Dr. Valentin Magnan, who studied alcoholism, tested pure wormwood oil on animals and discovered it caused seizures independent from the effects of alcohol. Based on this, absinthe, which contains a small amount of wormwood oil, was assumed to be more dangerous than ordinary alcohol. Eventually, thujone was isolated as the cause of these reactions. Magnan went on to study 250 abusers of alcohol and noted that those who drank absinthe had seizures and hallucinations. In light of modern evidence, these conclusions are questionable, as they are based on a poor understanding of other compounds and diseases, and clouded by Magnan's belief that alcohol and absinthe were "degenerating" the French race. After absinthe was banned, research dropped off until the 1970s, when the British scientific journal Nature published an article comparing the molecular shape of thujone to tetrahydrocannabinol (THC), the primary psychoactive substance found in cannabis (marijuana), and hypothesized it would act the same way on the brain, sparking the myth that thujone was a cannabinoid. More recently, following European Council Directive No. 88/388/EEC (1988) allowing certain levels of thujone in foodstuffs in the EU, the studies described above were conducted and found only minute levels of thujone in absinthe. In the United States, the addition of pure thujone to foods is not permitted. Foods or beverages that contain Artemisia species, white cedar, oak moss, tansy, or yarrow, must be thujone-free. Other herbs that contain thujone have no restrictions. For example, sage and sage oil (which can be up to 50% thujone) are on the Food and Drug Administration's list of generally recognized as safe (GRAS) substances. 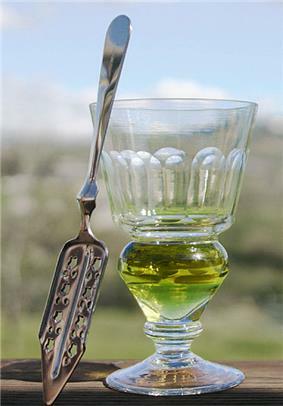 Absinthe offered for sale in the United States must be "thujone-free", which is interpreted as containing less than 10 mg/l. Absinthe with small amounts of thujone, therefore, can be legally imported. In Canada, liquor laws are the domain of the provincial governments. Alberta, Ontario, and Nova Scotia allow 10 mg/kg thujone; Quebec allows 15 mg per kg; Manitoba allows 6–8 mg thujone per litre; British Columbia adheres to the same levels as Ontario and all other provinces do not allow the sale of absinthe containing thujone. However, in Saskatchewan and Quebec, one can purchase any liquor available in the world upon the purchase of a maximum of one case, usually 12 750-ml bottles or 9 L. The individual liquor boards must approve each product before it may be sold on shelves. ^ Perry NB, Anderson RE, Brennan NJ, Douglas MH, Heaney AJ, McGimpsey JA, Smallfield BM (1999). "Essential Oils from Dalmatian Sage (Salvia officinalis L.): Variations among Individuals, Plant Parts, Seasons, and Sites". ^ Oppolzer W, Pimm A, Stammen B, Hume WE (1997). "Palladium-Catalysed Intramolecular Cyclisations of Olefinic Propargylic Carbonates and application to the diastereoselective synthesis of enantiomerically pure (−)-α-thujone". ^ a b Deiml T, Haseneder R, Zieglgänsberger W, Rammes G, Eisensamer B, Rupprecht R, Hapfelmeier G (Feb 2004). "Alpha-thujone reduces 5-HT3 receptor activity by an effect on the agonist-reduced desensitization". Neuropharmacology 46 (2): 192–201. ^ Meschler JP, Howlett AC (March 1999). "Thujone exhibits low affinity for cannabinoid receptors but fails to evoke cannabimimetic responses". Pharmacol. Biochem. Behav. 62 (3): 473–80. ^ Olsen RW (April 2000). "Absinthe and gamma-aminobutyric acid receptors". Proc. Natl. Acad. Sci. U.S.A. 97 (9): 4417–8. ^ a b Höld KM, Sirisoma NS, Ikeda T, Narahashi T, Casida JE (April 2000). "Alpha-thujone (the active component of absinthe): gamma-aminobutyric acid type A receptor modulation and metabolic detoxification". Proc. Natl. Acad. Sci. U.S.A. 97 (8): 3826–31. ^ Dettling A, Grass H, Schuff A, Skopp G, Strohbeck-Kuehner P, Haffner HT (2004). "Absinthe: attention performance and mood under the influence of thujone". J. Stud. Alcohol 65 (5): 573–81. ^ Naser B, Bodinet C, Tegtmeier M, Lindequist U. Thuja occidentalis (Arbor vitae): A Review of its Pharmaceutical, Pharmacological and Clinical Properties. Evidence Based Complementary and Alternative Medicine. 2005 Mar;2(1):69–78. ^ Absinthism: a fictitious 19th-century syndrome with present impact, Padosch et al. Retrieved Oct. 28, 2006. ^ Thujone—Cause of absinthism? Lachenmeier, Emmert et al. Retrieved Oct. 28, 2006. ^ Determination of a-/b-Thujone and Related Terpenes in Absinthe using Solid Phase Extraction and Gas Chromatography, Emmert et al. Retrieved Oct. 28, 2006. ^ Del Castillo J., Anderson M., Rubottom G.M. (1975). "Letters to Nature: Marijuana, absinthe and the central nervous system". Nature 253 (5490): 365–366. ^ Opinion of the Scientific Committee on Food on Thujone Scientific Committee on Food (2003) Retrieved Oct 28, 2006. ^ Laurie C. Dolan, Ray A. Matulka, and George A. Burdock (2010). "Naturally Occurring Food Toxins". Toxins 2 (9): 2289–2332. ^ FDA Regulation 21 CFR 172.510 – Food Additives Permitted for Direct Addition to Food for Human Consumption. Food and Drug Administration (2003). Retrieved Oct 28, 2006. ^ Substances generally recognized as safe. Food and Drug Administration (2003). Retrieved Oct 28, 2006. Lachenmeier DW, Nathan-Maister D, Breaux TA, Sohnius EM, Schoeberl K, Kuballa T (May 2008). "Chemical composition of vintage preban absinthe with special reference to thujone, fenchone, pinocamphone, methanol, copper, and antimony concentrations". J. Agric. Food Chem. 56 (9): 3073–81. Thujone.Info — Databank of peer reviewed articles on thujone, absinthe, absinthism, and independent thujone ratings of some commercial brands. The Shaky History of Thujone – Wormwood Society article on thujone and its history.